Art Deco dress set, circa 1930. Carrington & Company created some of the finest dress sets of the Art Deco era. 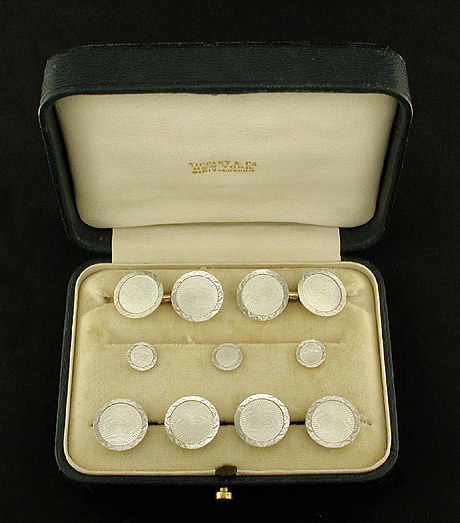 The firm's elegant creations included sets with beautifully engraved mother-of pearl centers. This jazzy example shimmers with radiant star centers surrounded by wavy platinum borders. The set beautifully captures the exuberant spirit of the Jazz Age. 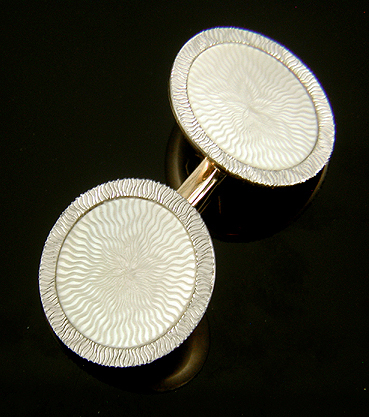 Crafted in platinum and 14kt gold, circa 1930. Dress set in Tiffany & Company case. The dress set was purchased at Tiffany & Company during the 1920s or 30s. The set is shown above in its original Tiffany case covered in green leather and lined with white silk. The inside of the lid is signed "Tiffany & Co./New York/Paris London" and the underside of the case is blind stamped "Tiffany&Co." just beneath the clasp. Carrington & Comapny was a significant supplier of fine dress sets and other jewels to Tiffany's in the early part of the last century.